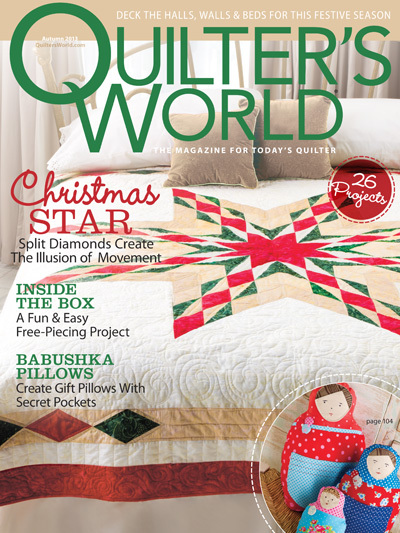 Hello Friends, I have been waiting for the perfect backdrop to take pictures of my Quilty Christmas Ornaments, featured in Quilter’s World Autumn 2013 issue. Below you see Quilty Christmas Ornament #1 on our tree this year. This ornament is a really quick stitchery project you can complete in a jiffy as a gift, or as an extra ornament to go on your tree. Have you ever had the situation where you feel bad throwing away narrow fabric scrap strips, but then you don’t know how to use them if you were to store them with the rest of your scraps (ask me how I know)? 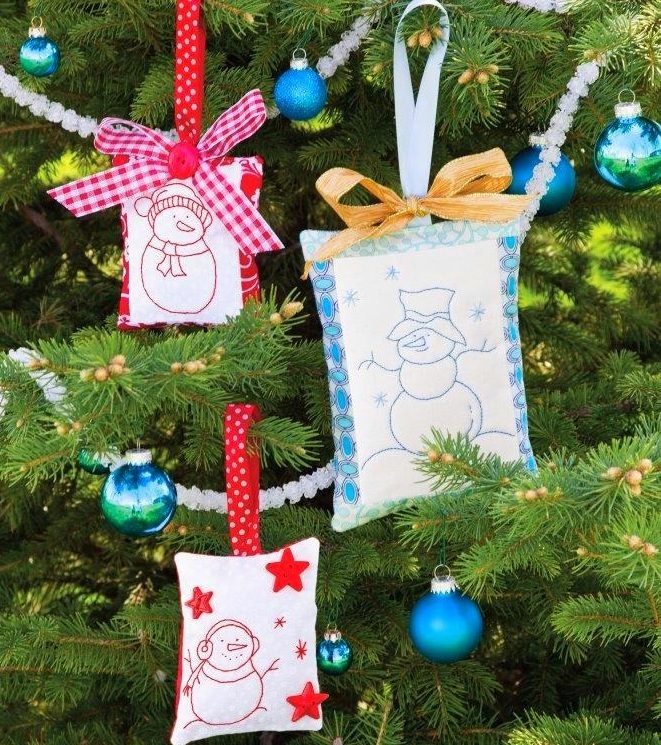 These quilty ornaments use up those narrow scraps nicely! A total of three ornaments are featured in the magazine spread. I had shared with you last year (click here) the controversy at Ivory Spring regarding white lights vs. “rainbow” lights. The rainbow lights are at the Ivory Spring household to stay for a while. Here you see some of the ornaments representative of the themes I have adopted for our tree. 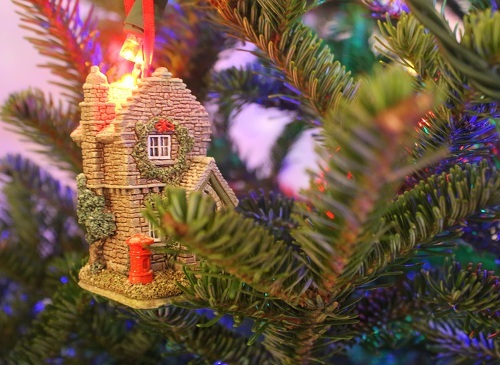 Curious mind wants to know if you have themes when you collect your Christmas ornaments, and if you have an absolute favorite ornament. Thanks for stopping by! It’s going to be a very busy day. So, I shall key off for now, but not before I wish you a very blessed day! Have you had a chance to check out my other 2013 featured projects? This entry was posted in "Scraps" Projects, Christmas, Quilts & Projects: Published and tagged Christmas embroidery ornament, Quiter's World Autumn 2013, Stitchery Project, Wendy Sheppard Designs. Bookmark the permalink. I haven’t commented as much this year – life has been too crazy for me to spend as much time on my favorite blogs. But I’m always checking in to see your lovely projects. You’ve had a very successful year! Hugs & Blessings to you and yours this Christmas season, my friend!!! Over the years I’ve had several different “styles”. I learned tole painting when my kids were at home so I have many painted ornaments from cats and bunnies to sleds and santas. I also collected cross stitched and hand stitched ornaments from church fairs over the years. They’re great and made from the heart. My favorite is a cute angel bought in 1982. PS I love my multi-colored lights. We are fans of the colored lights too. We don’t have any particular themes, but my favorite ornaments are always the ones that the children make us. Yours look so cute on your tree, Wendy. We have the old-fashioned colored lights that you cannot buy any more. I can barely find the bulbs for the. One year I found blue bulbs last year red and this year green. The new LED style are just not the same if you ask me. I love handmade ornaments from family, friends and my own. I also try to get an ornament when on vacation. When my daughter was born I started collecting ornaments each year for her. She already has a good start for whenever she is on her own. Most of hers are store bought. I love the hand-stitched ornaments you show here. You do such beautiful work. I will have to keep the idea in mind. Woooohoooo! I am always so proud of you! Ornaments? I buy what I like, but the St A tree has a nautical feel. I had serious trees for years with angels, but when Mama died, I got a lot of her whimsical ornaments. 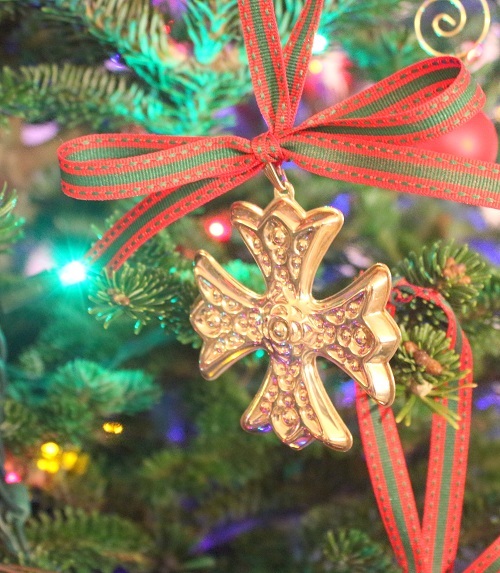 So I have gone that route… Though I bought a cross and three fleur des lis (sp) ornaments the other day. I just love them! We have no theme, just what ever appeals to us. I just bought a set of 3 today from Cost Plus, as they have “country” themed sets, and since we were in Germany this summer, the 3 ornaments will be great to put in my son’s and husband’s stockings. My absolute favorite ornament is a Hallmark one that I bought many years ago for my son that loved trains. It is a little snow scene with 2 trains that go around, and you can even blow a whistle if you push the button. Both of my boys love it too, and I know when the time comes to hand off the ornaments to the kids, they won’t care about any of them but this one! Your snowman ornaments are delightful btw! Very darling ornaments! Love to see all of your work! Thank you for sharing. Your tree is looking beautiful. I don’t really have a theme, just an eclectic mix! some made by the kids, which they tell me to throw out, but I haven’t the heart, I don’t care if they are not ‘designer’ decorations! love your new ornaments, I do not have a tree etc as I am on my own and have not even put up embriodered pictures done over the years, having a lazy time and doing what I want! Love your tree! As to the lights, I like all white mini lamps the best. But when growing up, it was the rainbow lights and I liked them, too. My fave ornament is older than I am. 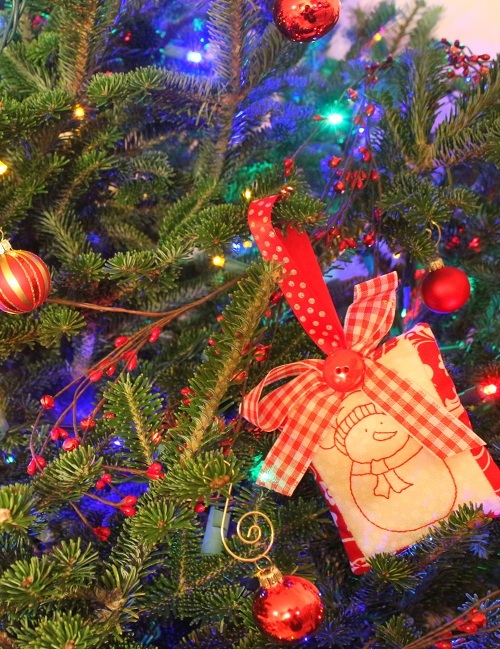 It must have been mom’s first ornament…a little ceramic angel only about 3.5″ high. It is from the late 40s-early 50s, so it’s vintage. When I moved out, I asked my mom if I could have that one and she gladly gave it to me. I no longer put it on the tree. It sits in a place of honor in my china hutch. White lights….just because they were on sale at one time. No theme but I do have “areas” on the tree where like ornaments gather. There is a Santa section, angels near the top, and a variety of sewing related ornaments that have been given to me over the years. Your stitched ornaments make me want to start stitching. 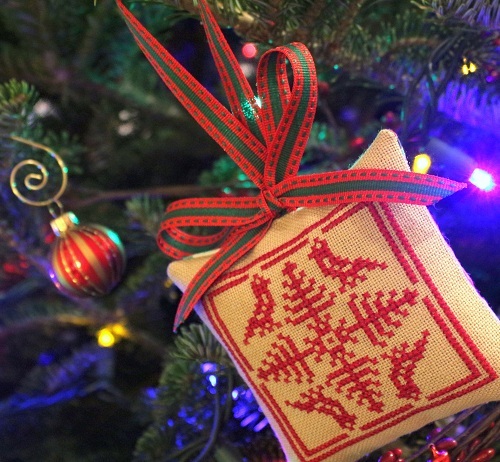 Your ornaments are “sew cute! !” I bet your tree is lovely with all the special ornaments. We have an eclectic mix of ornaments that have been collected for 50 Christmases. My husband and I have exchanged some, many were made by our children, and now grandchildren. I guess the theme is a tree filled with memories and mementoes. Beautiful hand stitched ornaments Wendy! And your tree looks lovely. At our home We have a cardinal / bird tree up year round. Love this special tree that my sister gifted me and has grown and grown in ornament count each year. (White lights). Our main Christmas Tree is a combination of old and new, glass and wooden, spun and molded with Santa and birds always being a focal point along side my moms spun glass ornaments (white lights). 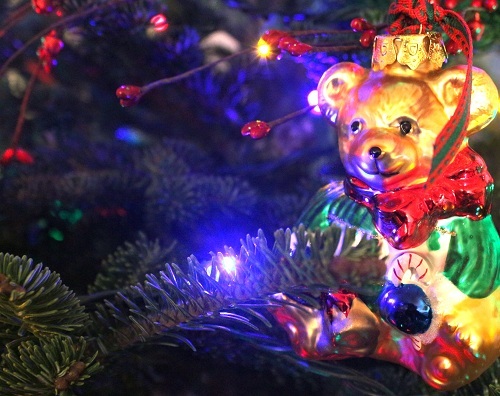 The third tree is a tall alpine tree with colored LED lights that is adorned with Santa Ornaments. We take our trees seriously around here and were blessed with a mom that contributed to the collection each year. Miss her so. Thanks for the memories my friend and have a Blessed Holiday. Just curious, is this all of your work or is it others too? If it’s yours how do you find time. I don’t work any more due to health reasons but am unable to keep this busy or motivated, any hints?